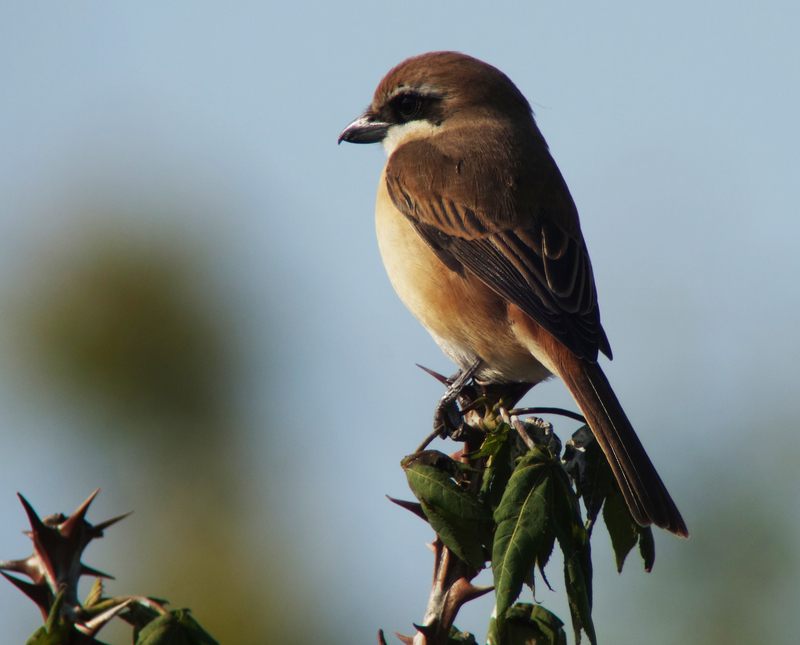 Brown Shrikes and the Annual Thorny Identification Challenge! Korea is probably the best place in the world to enjoy the full variation shown by Brown Shrike Lanius cristatus, especially during northward migration. 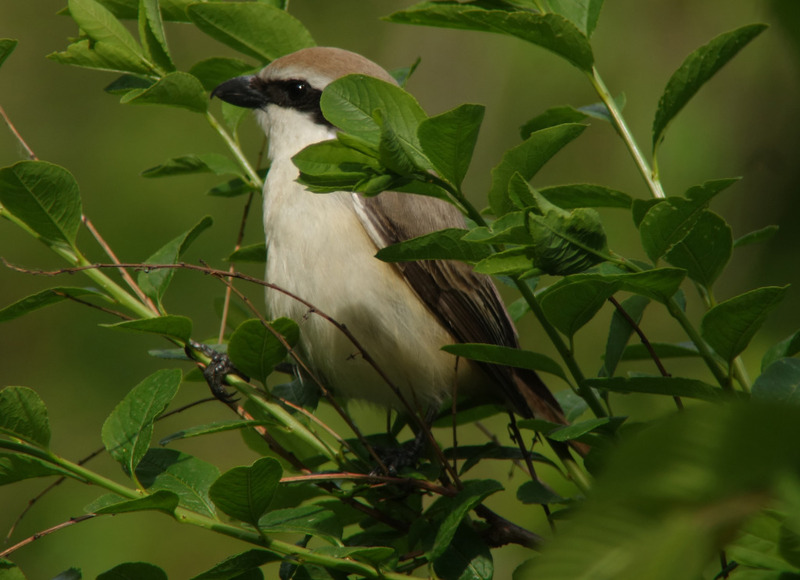 The IOC recognizes four subspecies, all of which have been recorded here in the ROK: cristatus (listed in the Birds Korea 2014 Checklist as P5, a very scarce migrant), lucionensis (P4, S5: i.e. an uncommon migrant and a rare breeder), superciliosus (V2: with less than 10 records up to 2014) and confusus (P3, a locally common migrant, that according to Tomek  is the taxon breeding in the DPRK). 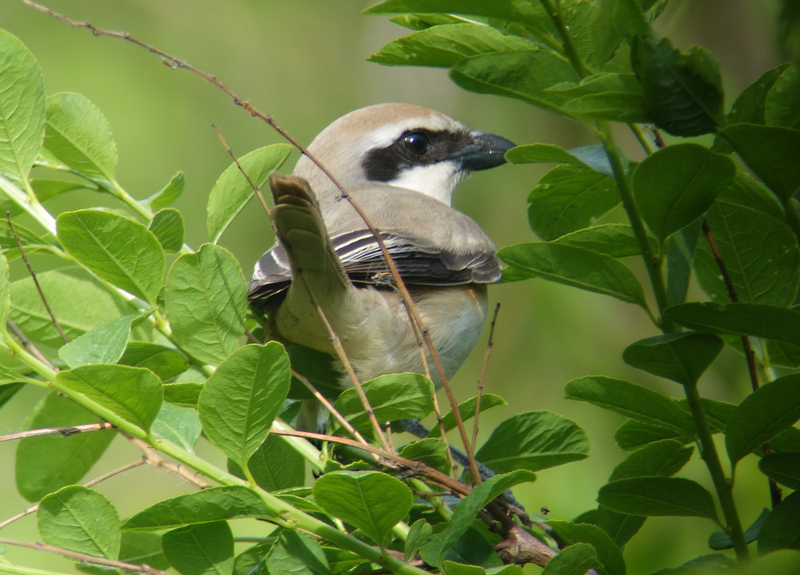 Indeed, this May on Baekryeong Island I saw all four Brown Shrike taxa – once even all on the same day (May 21)! 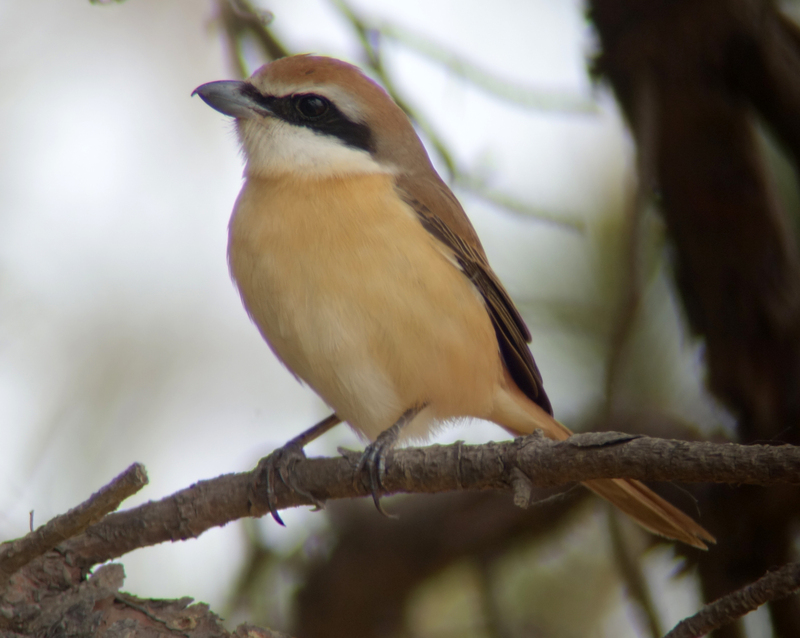 This note aims to present (and comment on) images of only a dozen or so of the Brown Shrike recorded during a total of 516 “encounters” (simple summing of day totals, without consideration of birds counted on more than one date) between May 10th and May 22nd 2015, in order to show some of their variability. 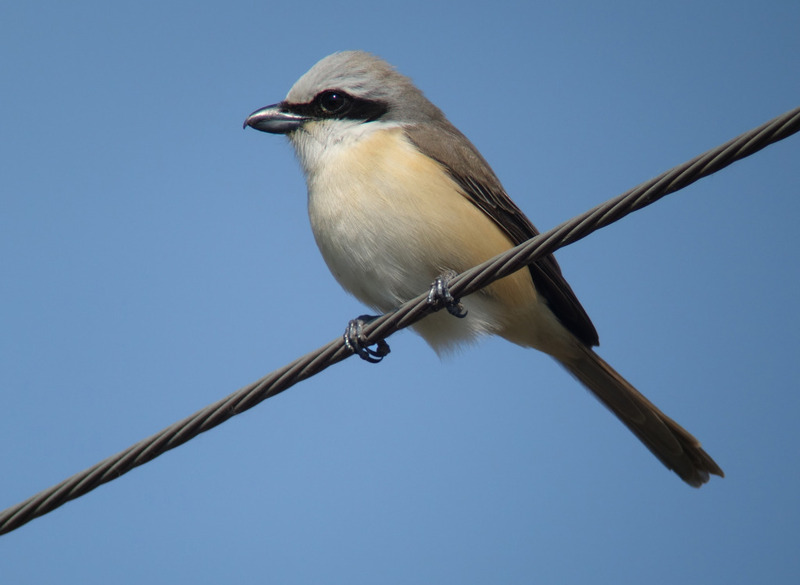 Taken together, these images should help to highlight some of the ID challenges presented each year by the Brown Shrike component of the Red-backed / Red-tailed / Isabelline/ Brown Shrike complex, even when in adult or adult-type (“alternate”) plumages. 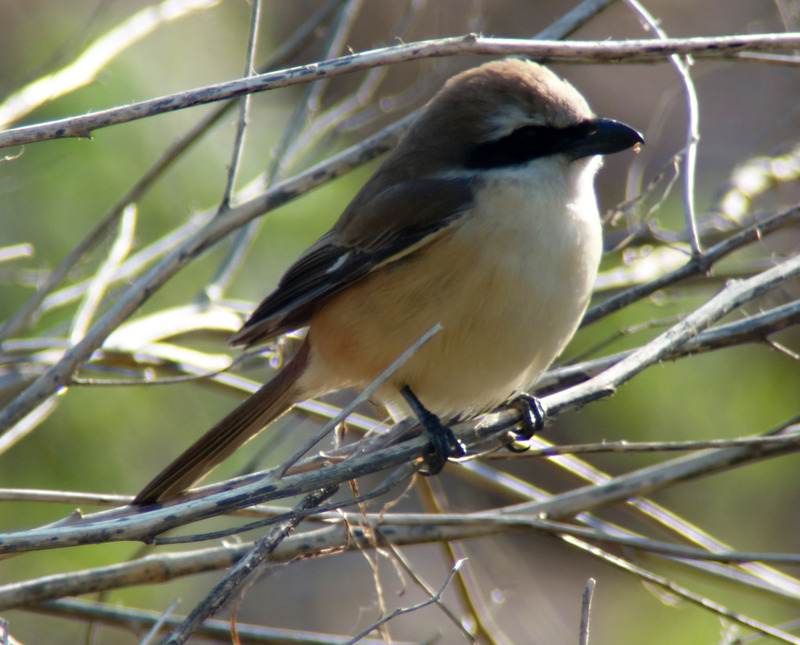 Although these shrikes are well-known to present a thorny ID challenge, their taxon-level variability still seems to be poorly understood by many birders who do not encounter them regularly: for example in the early appraisal of the “Mendocino shrike” in California in March and April 2015. 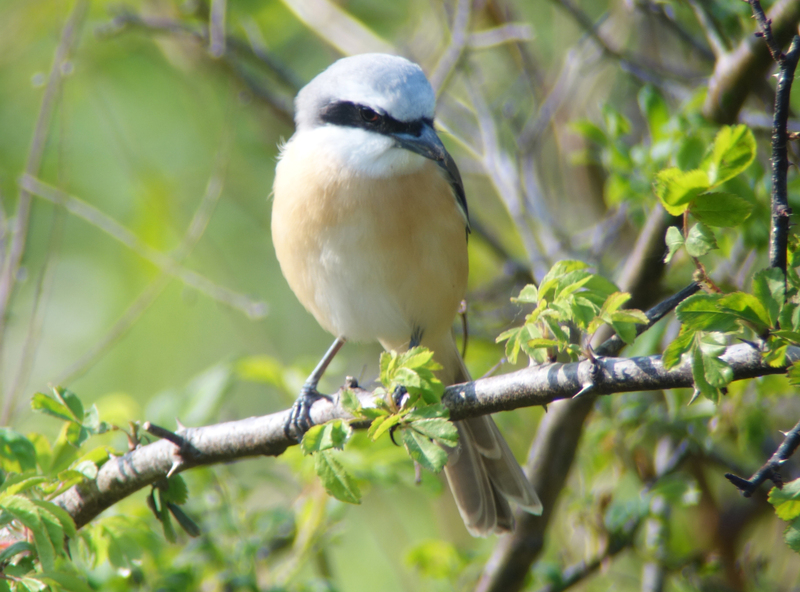 And, even now who really knows what confusus is – beyond a useful catch-all name for those “mixed” Brown Shrikes that seem not to be pure lucionensis, cristatus or superciliosus? All images (this year) were digiscoped by NM through a superb Swarovski scope and a handheld Sony RX100II. Lucionensis, Male, Baekryeong Island, May 13, 2015 © Nial Moores. 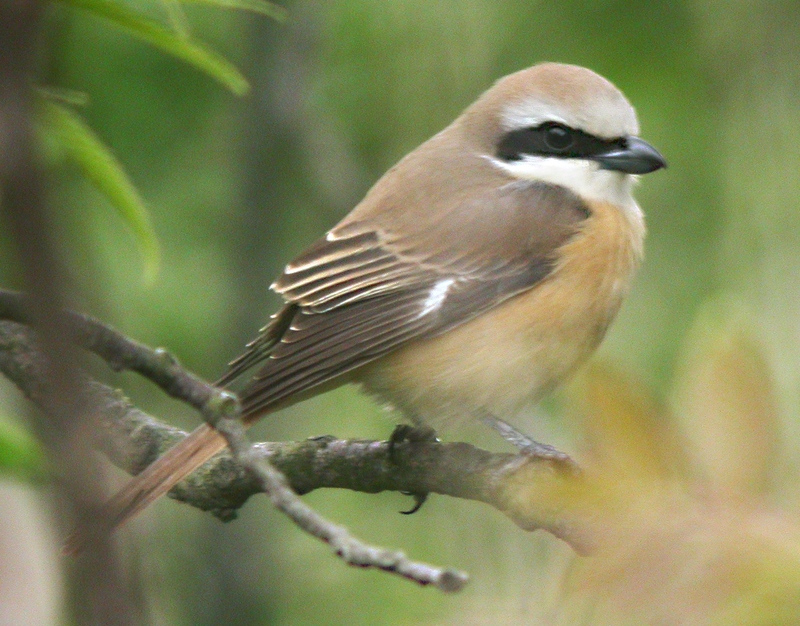 Probably the most distinctive of the Brown Shrikes, with an ash-grey crown; cold brown upperparts; warmer-toned but still cold tail; and apricot wash on much of the underparts. Note that the throat is contrastingly white; and that the supercilium is poorly-defined. As in all lucionensis, cristatus and confusus, the bill looks heavy; the tail looks fairly long with usually obviously shorter (and slightly narrower) outer tail feathers, creating a more graduated look when the tail is opened; and the primary projection is not so long (with usually ~5 five primary tips visible beyond the longest tertial). Lucionensis (or lucionensis-type), Male, Baekryeong Island, May 15 2015 © Nial Moores . Unlike the one on May 13th, this individual shows obvious brown admixed into the rear of the crown. Based on the plates in Worfolk (2000), this brown creep up onto the nape might perhaps be expected in a female, but the lack of vermiculations and the blackness of the face mask indicate it is a male. There appears to be some moult contrast in the greater coverts (with some white-edged and others brown-edged) suggesting it might instead be a Second Calendar-year male. Is the extent of brown in the crown sometimes age-related? Confusus, Male, Baekryeong Island, May 18th 2015 © Nial Moores. Although a poor-quality image note the general resemblance to lucionensis with e.g. brown-toned upperparts, white throat, apricot-washed underparts and greyish-tones to the forehead, without any well-defined supercilium. However, unlike pure lucionensis, this bird shows warmer tones to the upperparts and most of the crown is brown and warmer-toned. The tail is also rather warmer and it also has a small but quite obvious patch of white at the base of the primaries which is found only exceptionally in lucionensis. Confusus, Male, Baekryeong Island May 20 2015 © Nial Moores. In this individual the white at the base of the primaries is even more extensive, extending well past the primary coverts (and seems to be present on at least three primaries, with a buffish tone on a fourth). 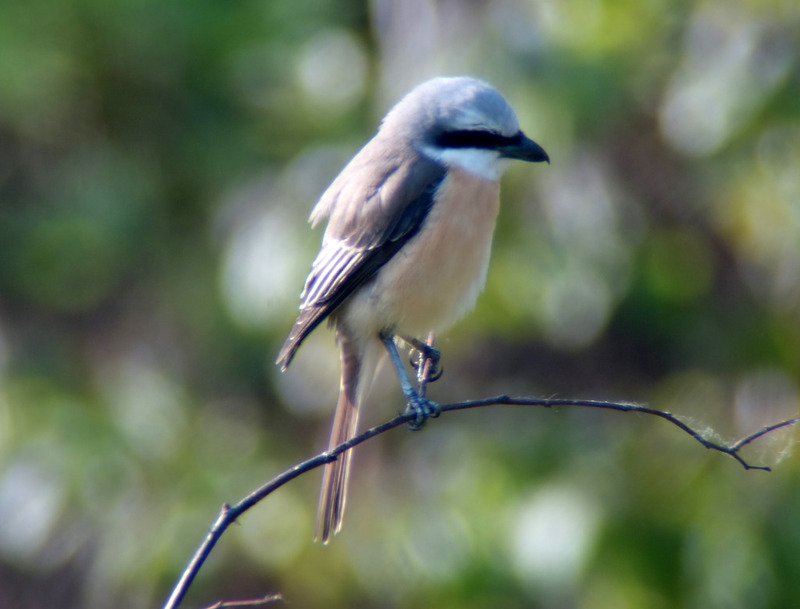 In addition, there is no grey in the crown or forehead: rather the crown is contrastingly warm and bright, superficially suggesting Red-tailed Shrike pheonicuroides (mapped by Worfolk as breeding far to the west/southwest of Asia). There is some white behind the eye (not the clear supercilium expected in either cristatus or especially supercilosus), and the throat is not white: it is instead more or less concolorous with the breast. Confusus, Male, Socheong Island, May 20 2009 © Nial Moores. 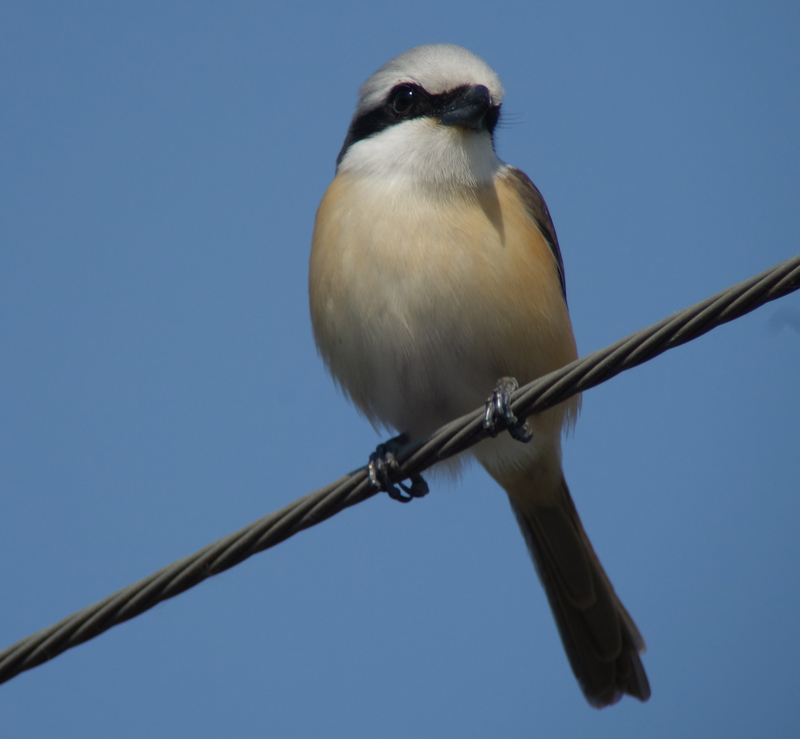 This individual is included here to show that some Brown Shrike can show really extensive white on the primary bases; and that some, like this bird, can also show much longer primary projection (with seven or eight tips visible beyond the longest tertial) than expected. Perhaps these two features in combination are indicative of some introgression from isabellinus (? ), even though it seems to be just toward the extreme end of what has over the years come to be expected in confusus. Plumage-wise, it at least seems a little closer to cristatus than lucionensis, with some suggestion of a supercilium (though with lucionensis-like grey tones to the forehead); weak contrast between the crown and the “saddle”; and more intensely colored butterscotch on the underparts. Confusus , Male, Baekryeong Island, May 21 2015 © Nial Moores. This was the palest-looking individual seen in May 2015. 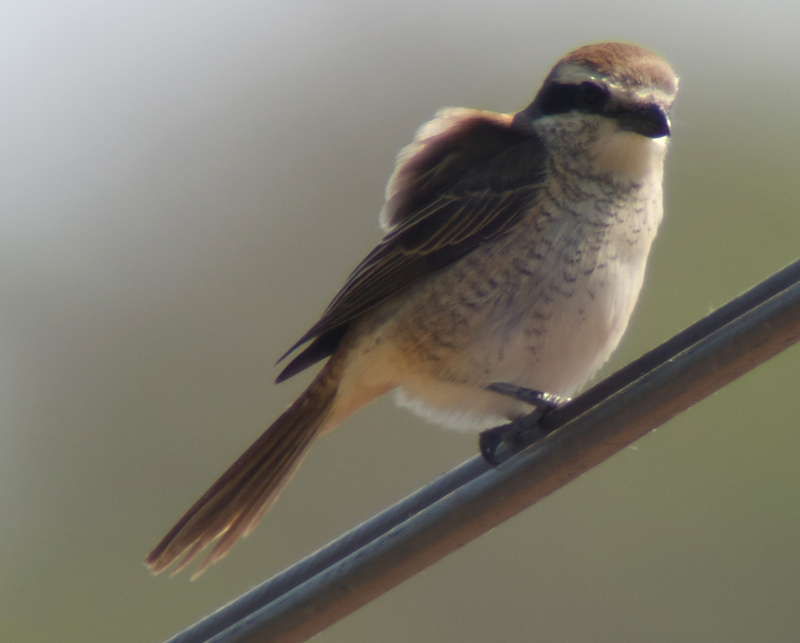 Showing strong contrast between the warm crown and cooler-toned “saddle”, the strong supercilium is all the same more indicative of cristatus than lucionensis; and the structure (narrow-tailed and heavy-billed) more indicative of Brown Shrike than of any other species in the complex. 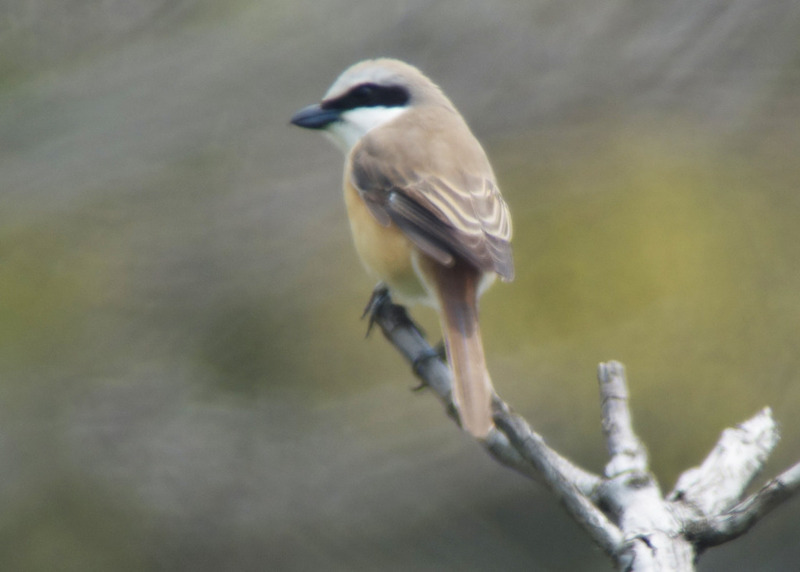 Confusus, Female, Bakryeong Island, May 20 2015 © Nial Moores. 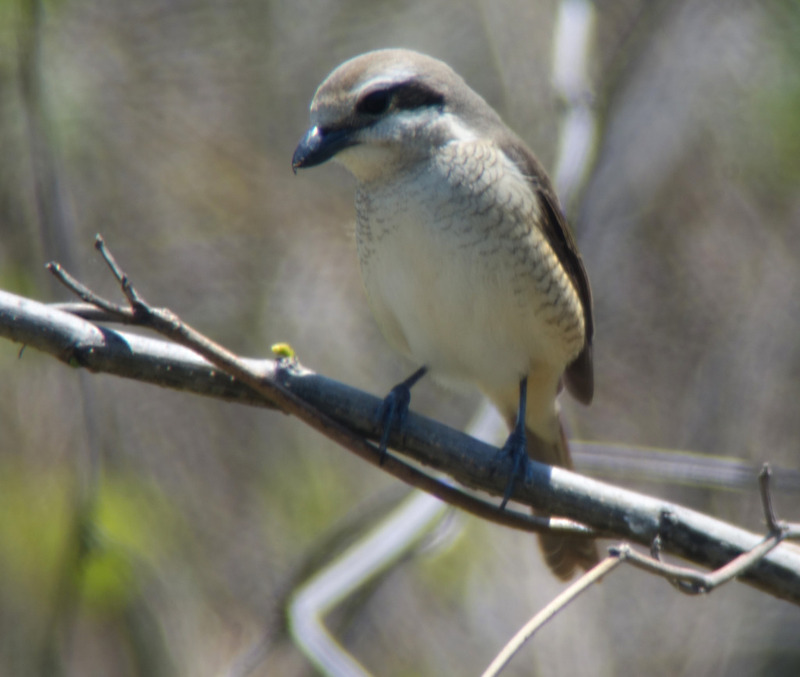 Warm-crowned and brown-backed, this individual showed perhaps the most extensive and coarse vermiculations on the underparts of any of the Brown Shrike seen on Baekryeong Island this spring. 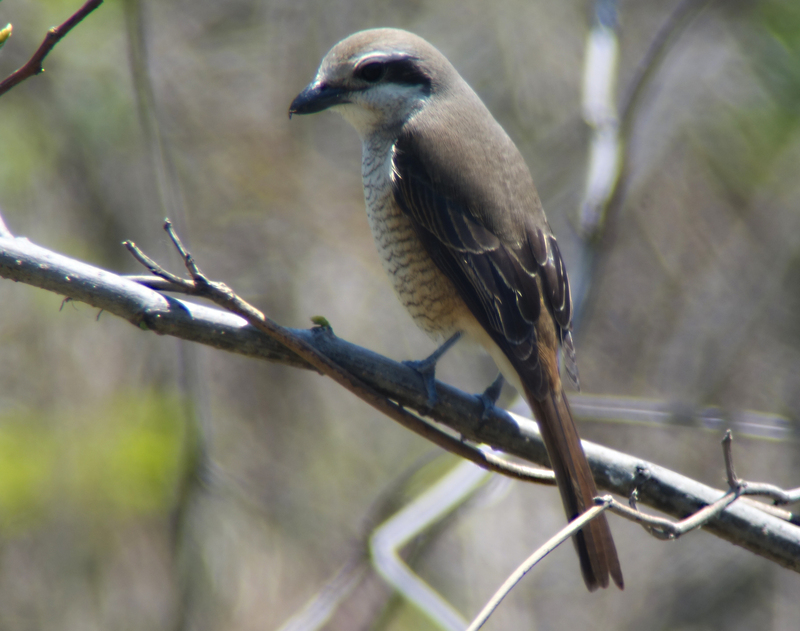 Although apparently structurally fit for a Brown Shrike, it also showed at some angles a faint hint of greyish tone to the nape: influence from lucionensis or perhaps even from one of the other taxa in this complex? Cristatus,Male, Baekryeong Island, May 15 2015 © Nial Moores. Warm-toned above and below, with a well-defined supercilium (slightly greyer toned to the rear) and a strongly orange-toned tail. Cristatus, Female, Baekryeong Island, May 21 2015 © Nial Moores. A very coarsely-marked individual (perhaps suggesting that this is a Second Calendar-year? ), with quite a short-looking tail. Cristatus, Male, Baekryeong Island, May 20 2015 © Nial Moores. 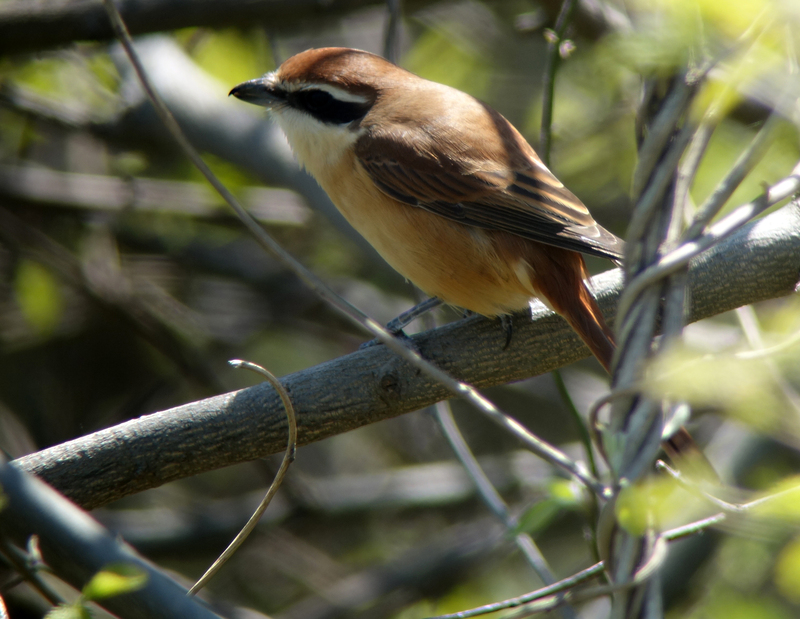 This was the most reddish-backed of the (presumed) cristatus seen during May, with “ferocious” red tones apparent when the bird was in shade or in full sunlight. Close to superciliosus in plumage tone above, this bird had a much weaker supercilium and more extensively orange-washed underparts than would be expected in that taxon. However, its bill appeared exceptionally slim (and pale-based), perhaps in combination with the upperpart colour suggesting some superciliosus influence? Supercilosus, Male, Gageo Island, May 22 2009 © Nial Moores. 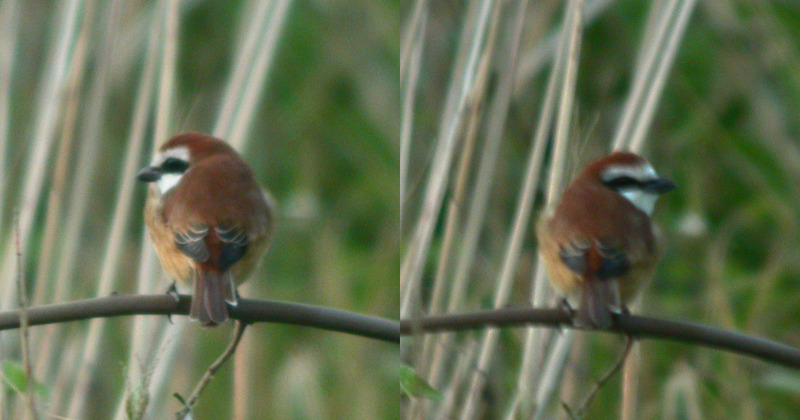 Very poor record shots included here for completeness. Similar in upperpart red to the cristatus above (though somewhat darker), it also showed a very strong, pure white supercilium and a gleaming white forehead “typical” of superciliosus. Confusus (? 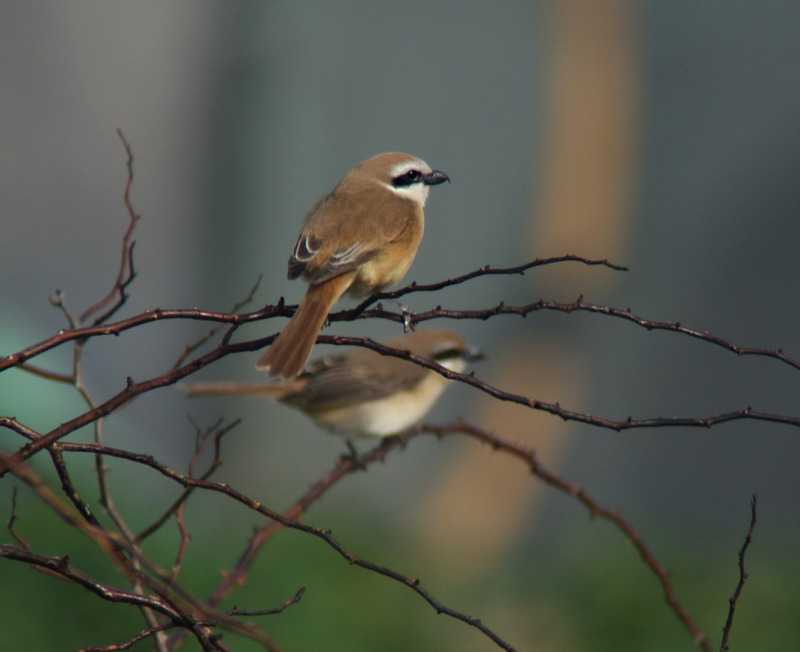 ), two Males, Baekryeong Island, May 13 2015 © Nial Moores. And just to finish…top cristatus-like bird showing features perhaps suggesting cristatus (warm upperpart tones, orangey rump and strongly colored underparts), supercilosus (strong white supercilium and broad white forehead) and lucionensis (lack of obvious reddish tones to the upperparts and hint of grey wash on the forehead); with bird behind showing features perhaps suggesting both lucionensis (brown-backed) and cristatus (warm tones to the crown and a narrow supercilium). As always, comments, corrections and opinions will be warmly received.